Upon walking into Hei La Moon on the periphery of Chinatown, a first-time visitor would be astounded by the dynamic sights and smells of the restaurant. The two-story restaurant is adorned in a beautiful red and gold color scheme. The strong aroma of Chinese food emanates from small dishes and steamers that travel around a maze of tables as servers push them in leveled carts. As each cart arrives at the table, you are given a choice of five or six dishes. Hei La Moon offers a variety of plates that cater to the first-time diners as well as the adventurous foodies. Each plate is delicately prepared and delicious flavors, so your chances of choosing a dish that is well prepared and quite delicious are high. 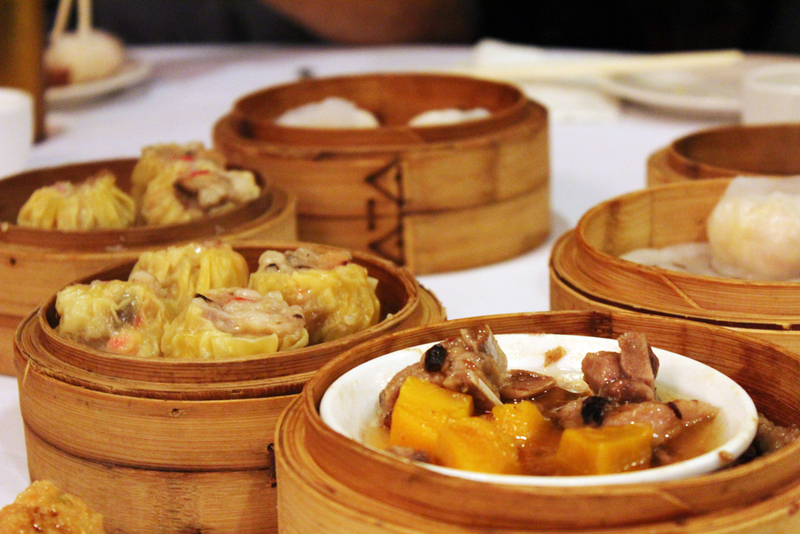 Hei La Moon specializes in serving dim sum, a traditional Chinese brunch accompanied by tea. Dim sum is said to have developed hundreds of years ago in roadside teahouses that accommodated local farmers and weary travelers on the Silk Road in China. In recent years, these small dishes have become a main attraction in Chinese restaurants around the U.S. Most of the dishes are fried or steamed and pushed around the restaurant in carts; you can simply order by pointing to the desirable dish. Each dish falls into a price category “small”, “medium”, “large”, or “special” (usually a larger entrée-sized dish) and each table is given a tally card. Whenever you choose a dish, the server will stamp the table’s card and at the end of the meal, the number of dishes will be totaled and paid for at the front of the restaurant. Hei La Moon offers many of the staple dishes of dim sum such as har gow (steamed shrimp dumplings), shu mai (steamed pork dumpling) and char siu bao (a steamed bun filled with sweet Chinese barbeque pork). Ever since I was a kid, my favorite dish was the cheong fun (rice noodle roll). My mom would call it “Chinese lasagna,” but essentially it is a thin roll of rice noodle filled with shrimp, beef, pork or cilantro and topped with a sweet soy sauce. The slightly fishy taste of shrimp tastes really well with the tangy sweet soy sauce. There are a number of other interesting savory dishes that cater to the more adventurous diner as well. For instance steamedchicken feet or chicken intestines with pickled greens and beef tripe. I tried chicken feet for the first time and I have to say the flavor was surprisingly good; the skin was soft with a sweet flavor. The bad thing: it was a bit of challenge trying to eat them because of all of the small joint bones. But other than that no complaints from me. Hei La Moon’s variety of dim sum dishes as well as well-executed authentic flavors have made it one of the premier places to get good dim sum in Boston. With ample seating, speedy service and relatively cheap pricing, Hei La Moon is a great place to go for a different take on the average Sunday brunch.